One of the best parts of ‘Ni No Kuni’ or ‘Another World’ is the fun host of characters in it. 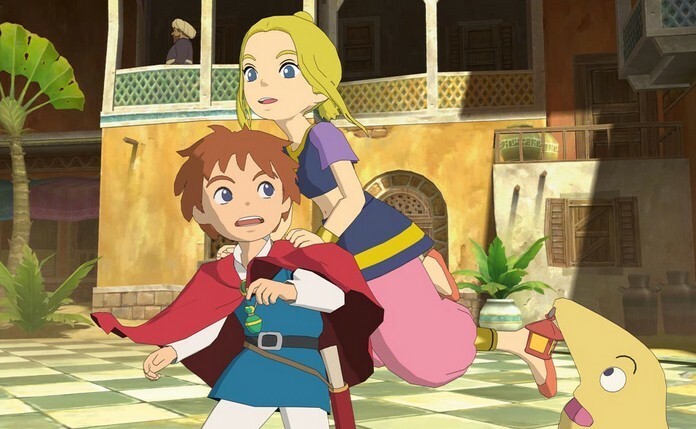 For the characters make the story, and the story was one of the main features of the game (other than the visuals and gameplay) that really earned Ni No Kuni its acclaim after the game’s release. Oliver is the main character and protagonist of the game. He is a thirteen year old boy who lives in a town called Motorville. He was born and brought up in Motorville and was raised by his mother Allie who he is very close to. He has a close friend named Philip and he works with him in designing mechanical items, especially vehicles. When he is testing a new vehicle that Philip has designed, he almost drowned, but his mother, Allie, saved him. However, after she saved him, she died. And after meeting Drippy, Oliver journeys to the “other world” in order to defeat the evil Shadar and save Allie’s soul mate Alicia in the hopes of bringing his mother back. Oliver later discovers that Allie is simply a future version of the great mage Alicia (who had, unable to defeat Shadar, travelled forward in time to Motorville and had settled down in the town as “Allie”), and that he (Oliver) is, in, fact Shadar’s soul mate. Drippy is a doll that Oliver’s mother Allie had given him. Drippy had once been a fairy and had been cursed by Shadar to become a doll. On Allie’s death, Oliver cried tears of grief that, when it touched Drippy in his doll form, it transformed him back into the fairy that he was. Drippy tells him about the “other world”, about Shadar, “soul mates”, and about great mage Alicia who looked a lot like Oliver’s mother Allie. Drippy acts as a guide for Oliver during his journey to defeat Shadar in the “other world”. Esther is the daughter of the great sage Rashaad of Al Mamoon. Esther is a vibrant and cheerful girl, and she is the first person Oliver meets and befriends in the “other world”. Esther is unendingly optimistic and positive, and she loves music. Swaine is a thief in the “other world” and he is the second person that Oliver meets and befriends in the other world. Their initial meeting occurs when Swaine steals an important item from Oliver, Drippy and Esther. But he soon ends up joining them on their quest and helps them on their journey to defeat Shadar. In the beginning, Pea is no more than a mysterious girl who appears to Oliver in his dreams and in his original world. She appears a number of times through Oliver’s journey and helps him out. On Shadar’s defeat however, and once the White Witch releases the manna spell on the three major provinces of the “other world”, she joins Oliver and stays as a more solid and permanent member of their group.